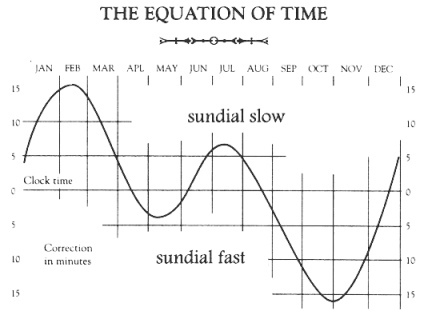 The curved line on the “Equation of Time” graph shows the variation of solar time to clock time. It indicates that during a year solar time gains and loses compared with clock time which remains constant. The variation is due to the Earth’s speed increasing and decreasing during it’s elliptical orbit around the Sun, causing the shadow to gain and lose as the Sun arrives on the meridian or noon mark at various times throughout the year. The ideal times to set the dial are during months of April, June, August or December when solar time and clocks come into line. Adjustments for the equation of time can be made to the sundial by slackening the nut connecting the sphere to the base and swivelling the sphere to the correct time.